Tuesday night I watched most of the game between the Philadelphia Flyers and Tampa Bay Lightning, about the most exciting TV sports option available to me at the time — and also the most confusing. Between the first and second periods NBC Sports Network analysts devoted nearly the entire intermission to breaking down a fight between B.J. Crombeen and Zac Rinaldo. They talked causes and effects, punches and counterpunches, winners and losers, as if this detour in-game action was a stand-alone contest. Later in the game Lightning star Vincent LeCavalier risked his health and his team’s medium-term success trading punches with Maxime Talbot. The announcers focused on the lopsided nature of the transaction; LeCavalier was by far the superior of the two players headed to the penalty box, making his team the loser in that exchange. I thought more about what would have happened if the Lightning’s captain had shattered his hand on Talbot’s helmet. Would his team have shrugged off the fight as a harmless flare-up if it had robbed them of their best player for the next six weeks? When the game ended and SportsCentre started, I saw those same two fights highlighted and replayed. And when I scan the internet for hockey news I’m reminded that hockey is as big a part of the NHL’s culture as ever. Which is strange, considering what we’ve learned in recent years about the damage hockey enforcers inflict and receive, and the public steps leaders in organizations from the NFL to the UFC have taken in trying limit head trauma. 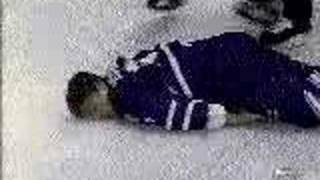 If we’re concerned about the long-term effects of gratuitous violence in hockey, this celebration of on-ice fighting is a strange way to show it. Understand, I’m not some outsider who — cue the air quotes and coded language — “doesn’t understand the culture of hockey.” I’m Canadian born and raised, as surrounded by the sport as every other sports fan north of the border is. And I’m not some pacifist with no stomach for contact sports. If you know me then you know I’m a connoisseur of the fistical arts — a boxing fan, martial artist and someone who understands that while combat sports can seem savage, they’re not synonymous with savagery. But I also understand that fighting is a sport, and hockey is a different sport, and the two should be kept separate the way they are in almost every other legitimate athletic endeavour on the planet. Can you name another sport besides lacrosse or roller derby in which punching out an opponent isn’t punishable by ejection and/or suspension? Yet a large segment of the hockey community remains intractable. They argue that hockey is different from other sports, and that fighting is a part of the game you can’t remove without spoiling the product. Since I can’t win those people over with logic, I’ll concede fighting is in fact as necessary to real hockey as caffeine is to real coffee. But if we’re going to make it part of the game, we should take steps to ensure that it really is part of the game. Here’s my modest proposal on how to make that happen. Hockey fighting advocates tell me fights energize fans and put bums in arena seats. The problem you never know when one will erupt, making it difficult to attract the fans who watch hockey to see fighting (as opposed to watching, say, fighting). So instead of waiting for fights to develop organically, the NHL should schedule them the way basketball schedules TV time outs. One fight at the first whistle after the 10-minute mark of the first period, and a second fight with two minutes remaining in the second. Viewers can build their patterns around the fights without having to navigate all that annoying hockey. If you’re watching on TV you know when to tune in, and if you’re at the rink you know when not to go to the bathroom. Because nobody wants to miss a fight. Among the most common defenses for hockey fighting is that whoever prevails can swing the game’s momentum in his team’s favour. If your teammates have forgotten how to skate and pass and shoot, they’ll remember in the moments after you pummel your opponent, and quickly crank out a series of goals. While there’s little evidence suggesting fights can change the outcome of games, we all know goals do. So I’m proposing we declare winners and losers for each hockey fight, with the only the losing team receiving a penalty — two minutes for losing by decision and five for losing by knockout. As the season progresses we can raise the stakes, awarding five-minute power plays for decision wins and paying off knockouts with a penalty shot. I mean, if we’re going to reward this behaviour, we might as well really reward this behaviour. Punching out foes brings power plays, and power plays bring goals. Talk about sparking your team. Will the NHL incur a hefty cost hiring and training fight judges? But fights bring fans — right? — and fans bring money. So between increased attendance and boosted TV viewership, the league and its teams will cover the cost with cash left over. 3. EVERYBODY FIGHTS… EVERY. DAMN. BODY. Since fighting is an indispensable part of the game, every player has not just a right but a duty to participate. Asking somebody not to drop the gloves is like asking them not to skate. It’s not fair and it’s not hockey. So under this proposal, everybody fights. Goons. Goalies. Goal scorers. Everyone. Before the opening faceoff teams decide who will participate in each of that night’s fights. 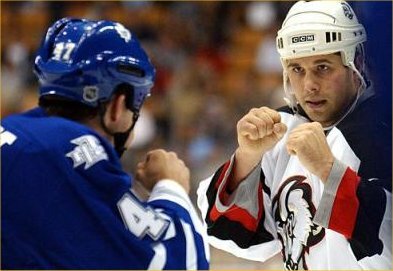 Because most NHL clubs still employ guys whose main job is brawling, we wouldn’t limit the number of fights a player can take part in per season, but we’d cap it at one per night and three per week. But to ensure fights are spread evenly across the rest of the roster, each player has to throw down at least once per season. Nominations are blind. Teams don’t know who their opponents have chosen for each fight until the whistle blows to start it and the combatants glide to centre ice. Under this system each team’s heavyweights would still tangle often simply because they’re most likely to have their number come up. But the rule would also allow a goalie like Mikka Kiprousoff an opportunity to pay back a sniper like Steven Stamkos, pounding last year’s goal-scoring champ into submission while goalies around the league delight in the vicarious thrill. And the system would set up showdowns between stars like Evgeni Malkin and enforcers like Colton Orr, which in turn sets up the very real possibility that a standout scorer could miss an entire season when a stronger and more experienced fighter caves his face in with a right cross. And when that happens we’ll all cringe, then question what role bare-knuckle fist-fighting plays in a sport that’s supposed to revolve around scoring and preventing goals. As if we don’t already know the answer.